An exact calculation of the total level of state and local subsidies for either company would be impossible due to the lack of a central economic development data source and inconsistencies in disclosure protocols among jurisdictions. However, a conservative estimate by the progressive economic policy research and advocacy group Good Jobs First suggests Wal-Mart has captured more than $1.2 billion in tax abatements, credits, exemptions, infrastructure assistance and financing deals during four decades of rapid expansion that has left the company with 4,672 retail locations across the country. An analysis of similar subsidy data, however, shows Amazon could surpass Wal-Mart’s $1.2 billion record later this year. At the end of 2016, Good Jobs First and the Institute for Local Self Reliance (ILSR), a progressive policy group focusing on sustainable community development, pegged Amazon’s record for state and local subsidies at just over $1 billion ( for data on Amazon-awarded subsidies since 2015, see chart below). The new year began with Amazon committing to build out its rapid-delivery business model, and states and municipalities lined up to help. In less than three months, Amazon racked up another $92 million in tax credits and exemptions to develop warehouses and fulfillment centers in California, Illinois, Kentucky, Maryland and Michigan. Good Jobs and ILSR concede that their data is a conservative proxy for the full value of the subsidies distributed to Amazon due to transparency gaps in states. For example, Good Jobs is reporting approximately $43 million in total subsidies for Amazon facilities in the Illinois towns of Aurora, Joliet and Monee. 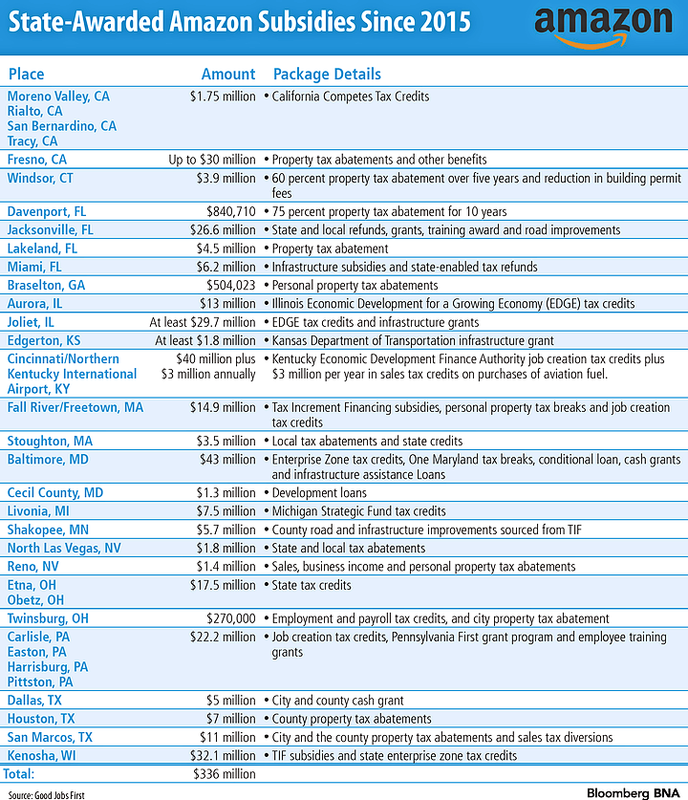 But a new disclosure tool unveiled by the state March 16 shows $112.2 million in job creation tax credits for the three communities (see related story, this issue). Good Jobs First and ILSR, frequent critics of government interventions to subsidize private development, said Amazon’s aggressive “let’s-make-a-deal” strategy is irresistible to most state and municipal officials. But a closer look at the impacts of Amazon’s business model and the online Goliath’s history of sidestepping state sales tax collection duties raises questions about the company’s worthiness for barrels of new public incentives. Moreover, they assert that states, cities and counties are actively supporting Amazon’s campaign to cannibalize other players in the retail sector. Amazon spokesperson Jill Shatzen Kerr declined to comment on the company’s strategy regarding tax incentives. In the past, however, she noted that Amazon has emphasized its success as a job-creation machine as a rationale for new tax benefits. On Jan. 12, the company issued a statement touting its creation of 150,000 U.S. jobs in the previous five years, growing its domestic payroll from 30,000 to 180,000. Amazon also announced a commitment to add 100,000 full-time positions over the coming 18 months. Amazon has had a mixed relationship with state and local taxes since its founding in 1994. The company’s early success as a retailer was due in part to its refusal to collect state sales and use taxes. Amazon cloaked itself in immunity under the nexus standard established by the U.S. Supreme Court in Quill Corp. v. North Dakota504 U.S. 298 (1992), which bars states from requiring remote sellers to collect and remit taxes if the vendor lacks a physical presence in the state. Critics contend the practice provided Amazon with a 6 percent to 10 percent price advantage over traditional retailers, which were obligated to collect such taxes due to their physical presence within each taxing jurisdiction. Before 2005, Amazon maintained warehouses and distribution centers in just a handful of states to avoid physical nexus and maintain its market advantage in the vast majority of states. Donald Bruce, a professor of economics at the University of Tennessee and an authority on state and local tax policy, said this strategy turbocharged Amazon and frustrated state revenue departments. Bruce pointed to a report he co-authored that pegged the state tax losses from all e-commerce retailers at $11.4 billion in 2012. The losses for the years 2006 through 2012 likely topped $52 billion, the report concluded. Bruce couldn’t quantify Amazon’s sales tax avoidance for that period, but he noted the company was certainly one of the largest retailers in the online arena and was growing by leaps and bounds during that time. In 2011, however, Amazon made a strategic decision to become a tax collector instead of a tax avoider. Amazon decided to focus its business on convenience and rapid delivery, Bruce said. The Amazon Prime free two-day shipping service has become wildly popular, with more than 54 million subscribers, according to Consumer Intelligence Research Partners. And over the last year, the company has expanded its same-day delivery service to more than two dozen metropolitan areas. To deploy this rapid-delivery model, Bruce said Amazon began building distribution centers and sorting facilities in almost every major metropolitan area. Without the benefit of the nexus loophole, Bruce said Amazon had to strike agreements committing to collect and remit sales tax in each state hosting a distribution facility. Bruce said Amazon also determined that it could profit from this new posture by charging tax collection and remittance fees to the estimated 2 million sellers using Amazon’s e-commerce platform. Amazon’s evolution as a coast-to-coast tax collector is nearly complete after the company made commitments in recent weeks to begin collections in 10 states. Amazon either collects or has committed to collect sales tax in all but two states with a statewide sales tax, plus the District of Columbia. The company doesn’t collect sales tax in Idaho and Maine. Alaska, Delaware, Montana, New Hampshire and Oregon don’t have statewide sales tax laws. Mitchell said Amazon’s shift in strategy was accompanied by a decision to aggressively pursue tax subsidies as it erects warehouses and distribution facilities. She said the company came to state and local economic development officials with a sense of entitlement. In many cases, Bruce said state and local officials were in no position to resist Amazon’s demands. Not only was Amazon offering to create thousands of jobs, but it was also offering to open a fire hose of previously uncollected sales taxes. “States were looking with anticipation at the revenue gains from having Amazon establish physical presence in their states, so they were willing to take a hit on incentives to get that nexus established,” he said. Mitchell and LeRoy said state and local units of government paid a pretty penny for these revenue streams. Using data developed through “ Subsidy Tracker,” Good Jobs First’s national search engine for economic development subsidies, Mitchell said Amazon collected tax subsidies totaling $613 million between 2005 and 2014 as it constructed 77 warehouses and fulfillment centers. Amazon also grabbed $147 million in tax benefits linked to its development of data centers, bringing it $760 million in total benefits through 2014. LeRoy said the scurry for subsidies continued in 2015 and 2016, but at a faster pace. A Good Jobs First report entitled “ Will Amazon Fool Us Twice” shows the company during those years collected $241.3 million in subsidies on 22 projects in 14 states ( for more details on these subsidies, see chart below). The December 2016 report points to several megadeals, including $43 million in tax credits, reductions, loans and grants for a facility in Baltimore, Md. ; $32.1 million in tax increment financing and income tax credits for a facility in Kenosha, Wis.; and $29.5 million in income tax credits and reductions for a facility in Joliet, Ill.
$1.3 million in loans for a distribution center in Cecil County, Md. Additionally, Amazon struck a deal in January with the Kentucky Economic Development Finance Authority providing $40 million in tax incentives to support a $1.49 billion investment in an air cargo hub attached to the Cincinnati/Northern Kentucky International Airport. Separately, the Kentucky Legislature has approved H.B. 368, which provides a sales and use tax credit to air carriers that purchase aviation fuel. The legislation was designed to support Amazon’s hub, offering the retailer up to $3 million in tax benefits annually. Gov. Matt Bevin (R) has already signaled his support. LeRoy expects more of these announcements throughout the year, particularly in states such as Arkansas, Mississippi, Missouri and Oklahoma, where Amazon recently announced plans to collect sales taxes. “There is no sign of slowing because they are building everywhere,” he said. Many economists and development professionals argue that tax incentives should be reserved for companies creating high-quality jobs that would otherwise be unavailable to a community. LeRoy and Mitchell contend Amazon is likely failing on these fronts. Despite Amazon’s creation of thousands of jobs in multiple markets, it is a net jobs killer in the transition from a brick-and-mortar retail environment to an electronic environment. Amazon’s growth, they say, is coming at the expense of Macy’s Inc., The Limited, the J.C. Penney Co., Sears Holdings Corp. and American Apparel, which have all announced job cuts in recent months. ILSR’s report on Amazon acknowledged the company’s creation of nearly 150,000 jobs across the U.S. by the end of 2015, but the company also displaced enough sales at traditional stores to force the elimination of 295,000 retail jobs. The report concluded Amazon’s expansion had caused a net loss of approximately 149,000 U.S. jobs. “This is not about net job creation, it’s about job churn,” LeRoy said. The University of Tennessee’s Bruce declined to pass judgment on Amazon’s tax subsidy aspirations, but said he takes a dim view of incentives aimed at the retail sector. Bruce, who has provided policy support to state economic development authorities, noted that retail jobs don’t pay strong wages and do little to stimulate activity in the broader economy. The notion that state and local development agencies might provide incentives to one retail entity at the expense of others is even more troubling. “If the state and local tax policies are creating winners and losers and furthering the erosion of local jobs in retail, that is a real serious issue we need to address,” Bruce said. Timothy Bartik, a senior economist at the W.E. Upjohn Institute for Employment Research in Kalamazoo, Mich., expressed similar concerns regarding public subsidies for entities creating retail industry jobs. While declining to comment on Amazon’s particular tax incentive strategy, Bartik said scenarios in which governmental units provide a menu of benefits to one entity that cannibalizes existing jobs in the community would be foolish. Bartik, who recently published an expansive database examining business incentives for economic development, said state and local governments have generally used their property tax, job creation tax credit and research and development tax credit programs poorly. Bartik’s database estimated $45 billion in incentive costs for 2015, but it is unclear if the states and municipalities offering these benefits received an honest return on their investments. Text of Good Jobs First's report, "Will Amazon Fool Us Twice," is athttp://src.bna.com/m4N. Text of ISLR's report, "Amazon's Stranglehold," is at http://src.bna.com/m4O.